KOKOMO, Ind. — After beginning the season with nine games on the road, Indiana University Kokomo Cougar fans are ready to cheer on the men's basketball team in their home gym. 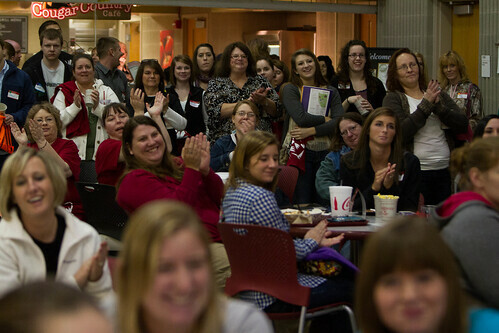 See more Homecoming photos here.Students, faculty, staff, and other fans gave the team a rousing welcome at a pep rally Tuesday, December 4, in the Kelley Student Center Commons. The first-ever cheerleading squad made its debut, and PSY, otherwise known as Christina Downey, assistant professor of psychology, made a surprise appearance. PSY and cheerleader Jeremiah Smith led dancing to "Gangnum Style," drawing loud cheers and applause, and the Crescendos choir performed the IU fight song. Coach Jace Thompson encouraged everyone to come to Tuesday's first home game, and Saturday's Homecoming game, to support the Cougars. "Be part of the culture that has changed the campus here," he said. "We can't wait to play in front of our great home crowd." Interim Chancellor Susan Sciame-Giesecke said it's important to support the student athletes, who have worked hard to represent the campus. "We couldn't be more proud of all our student athletes," she said. "This is our first home basketball game, and we want a big crowd there to support them. This is history in the making." Members of the Cougar Crazies cheering section are ready to wear their red shirts and foam paws, leading the way in supporting the team at the games. "We're excited to get people at the games," sophomore Shelby Spall said. "We want to support the players and the program. Sports are a great addition to our campus, and make students want to be involved." Brittany Royer, a junior, said the games give students something in common, and brings students back to campus when they are not in class. "It's a fun way to support our fellow students, and to feel pride in our school," she said. Junior Jacqueline Bean looks forward to attending games with her two-year-old son. "Going to the games is an important part of the whole college experience," she said. Tuesday's game against Brescia University is at 7 p.m. at Kokomo High School, 2501 S. Berkley Road, Kokomo. Fans should use Entrance 13. Saturday's Homecoming game against Purdue North Central is at 3 p.m. at Kokomo High School. Admission is $5 for adults. IU Kokomo students, faculty, and staff, as well as children younger than 12, will be admitted free.